Fashion Designer Catherine Walker produced more than 1000 outfits for Princess Diana. My favourite of them all was a black silk velvet halterneck worn for Diana's Vanity Fair photo shoot by Mario Testino. It may be a surprising choice as it is fairly plain. Although with it's classic structure, the subtle shimmer of the black bugle beading on the halterneck straps, elegant draping and a thigh high side slit. It was entirely glamorous and showed Diana at her happiest and most confident. Catherine passed away in 2010 but the company is continuing to build on her incredible design legacy. 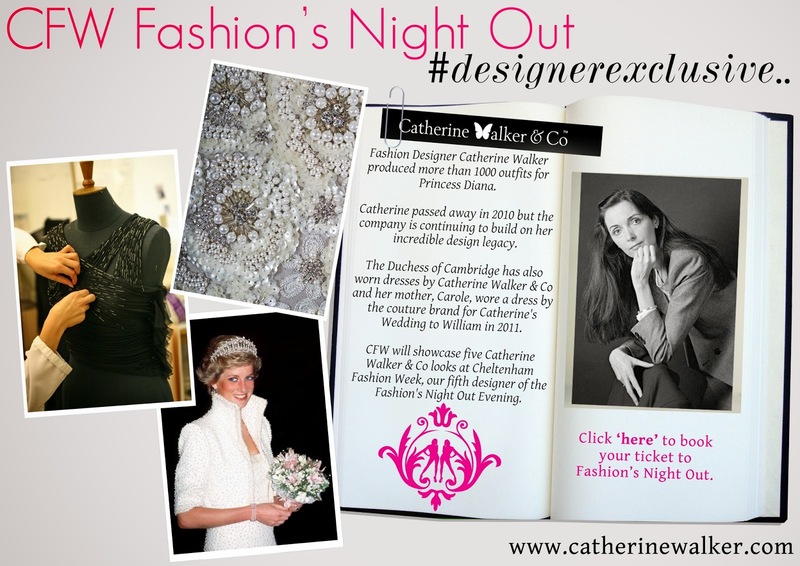 I am honoured to showcase a collection of five dresses by Catherine Walker & Co at Cheltenham Fashion Week, our fifth designer of the Fashion's Night Out Evening.